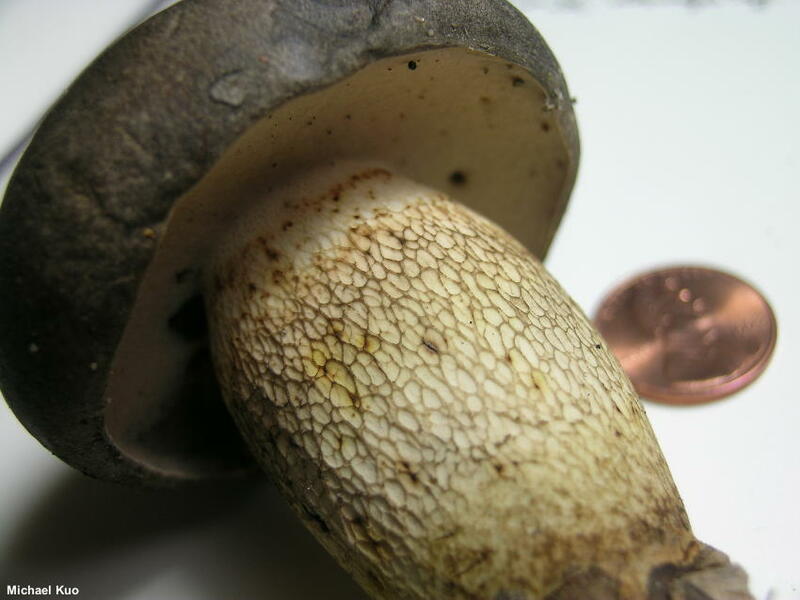 Retiboletus griseus is gray and drab, and not the most memorable of boletes—though it is fairly common in eastern North America's oak-hickory forests, and relatively easy to identify. 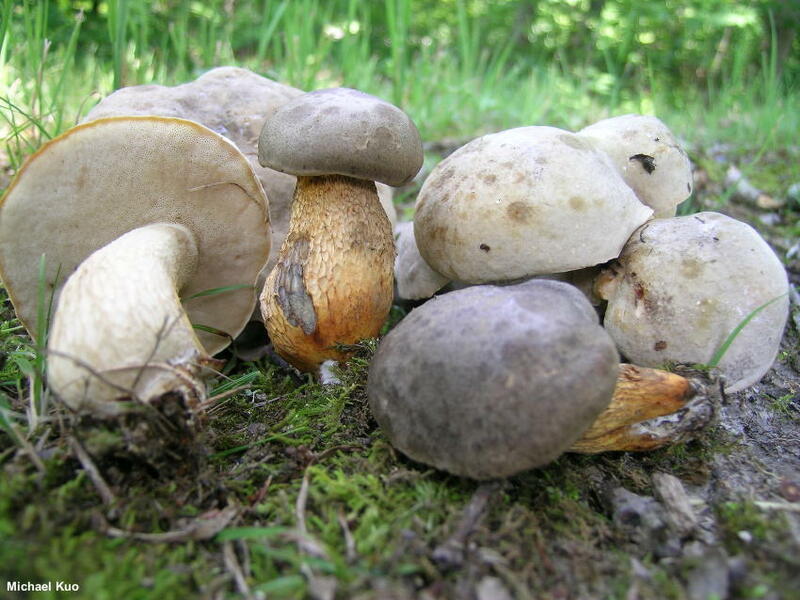 The stem is the most distinctive feature; it is coarsely and widely reticulate with a yellowish to brownish pattern that darkens when the mushroom is handled, and it stains and bruises yellow as it matures, especially in the lower half. It is often one of the first mycorrhizal mushrooms to appear in early summer—but it continues to fruit throughout the summer and into the fall. 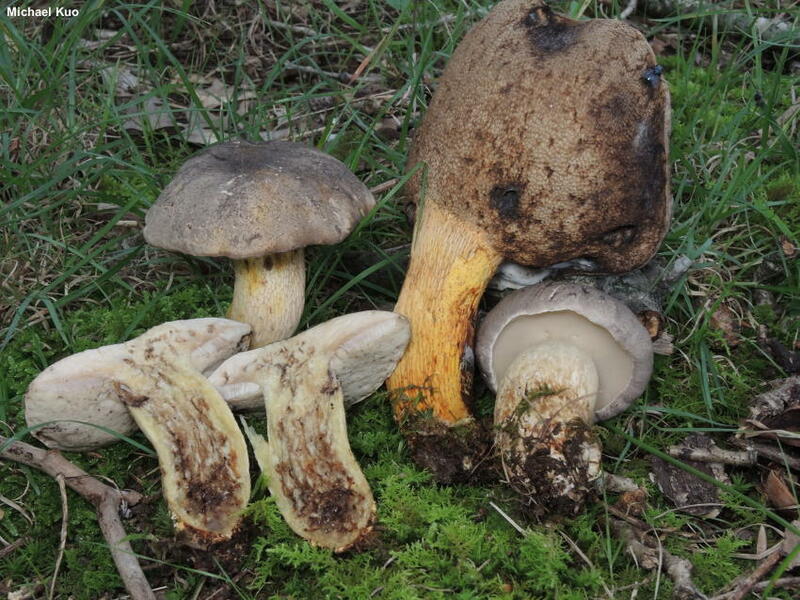 Retiboletus fuscus is very similar, but grows under pines along the East Coast and in the southeastern United States; its stem does not become yellow, but it does develop red stains and discolorations. Spore length also separates the two species. 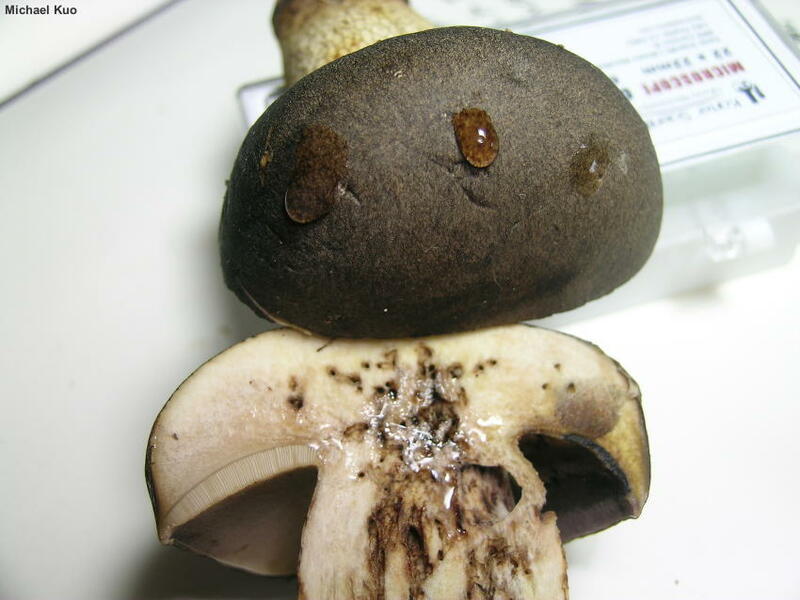 Boletus griseus is a previous name. Ecology: Mycorrhizal with oaks and other hardwoods; growing alone, scattered, or gregariously; early summer through fall; widely distributed east of the Rocky Mountains, and sometimes reported in the Southwest. The illustrated and described collections are from Illinois. Cap: 2–9 cm; convex, becoming broadly convex or nearly flat; dry; finely velvety when young, becoming more bald and leathery with age; dark grayish brown when young, becoming dull grayish brown to gray; streaked with darker appressed fibrils. Pore Surface: Whitish when young, becoming brownish gray to dull tan; not bruising, or bruising slightly brown; 3–4 circular pores per mm; tubes to 1 cm deep. 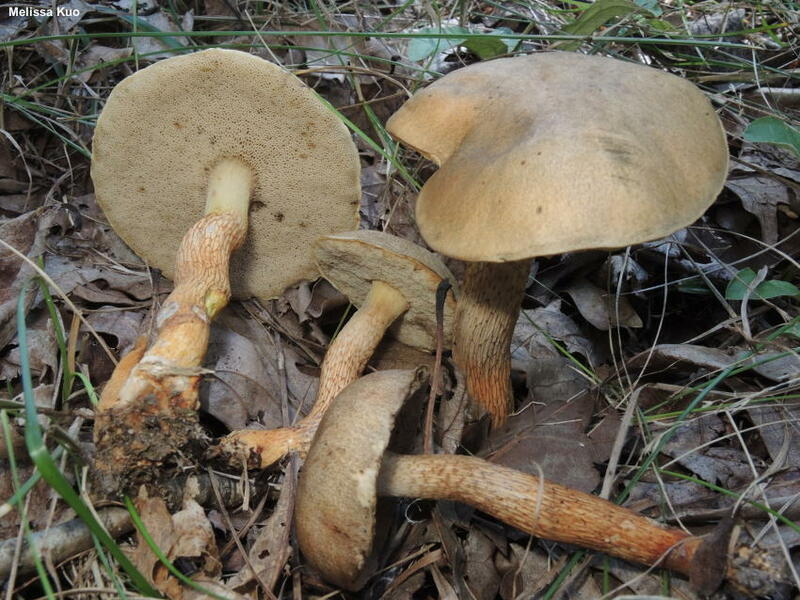 Stem: 3–9 cm long; 1–3 cm thick; more or less equal, above a slightly tapered base; whitish, becoming chrome yellow to orangish yellow from the base upwards as it ages; prominently reticulate (usually over the whole stem) with a wide-meshed, white reticulum that becomes yellowish, then brownish or blackish in age or when handled; solid; the base often curved. Flesh: White; not staining, or staining slightly pinkish when sliced; becoming yellow in the stem with maturity; chrome yellow in stem base; often riddled with worm tunnels. Odor and Taste: Odor slightly sweet, or not distinctive; taste not distinctive. Chemical Reactions: Ammonia negative on cap surface; negative on flesh. KOH negative to pinkish to orangish on cap; pinkish to orangish or grayish on flesh. Iron salts negative to gray on cap; negative to gray on flesh. Spore Print: Reported as olive gray to yellow-brown. 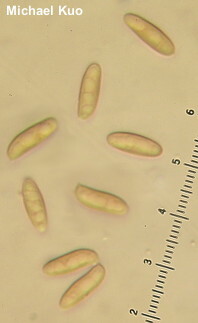 Microscopic Features: Spores 10–12 x 3.5–4 µm; subfusiform; smooth; brownish in KOH. 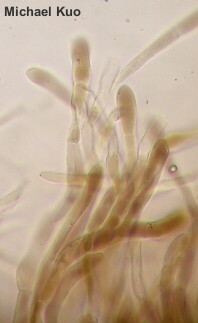 Hymenial cystidia to about 50 x 12.5 µm; lageniform; thin-walled; smooth; often brownish yellow. Pileipellis a dense, collapsing trichoderm; elements 2.5–10 µm wide, golden brown to dark brown in KOH, smooth; terminal cells cylindric with rounded apices, subfusoid, or fusoid-ventricose and cystidioid. REFERENCES: (Frost, 1878) Binder & Bresinsky, 2002. (Saccardo, 1888; Coker & Beers, 1943; Singer, 1947; Smith & Thiers, 1971; Grund & Harrison, 1975; Smith, Smith & Weber, 1981; Weber & Smith, 1985; Phillips, 1991/2005; Metzler & Metzler, 1992; Both, 1993; Barron, 1999; Bessette, Roody & Bessette, 2000; Binder & Bresinsky, 2002; Roody, 2003; McNeil, 2006; Kuo, 2007; Ortiz-Santana et al., 2007; Binion et al., 2008; Kuo & Methven, 2014.) Herb. Kuo 07079504, 06170201, 06300706, 07190802, 07041401, 08281604.